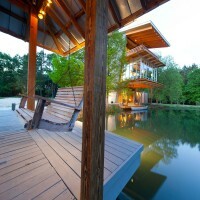 Holly & Smith Architects have designed the “Pond House at Ten Oaks Farm” in Hammond, Louisiana. 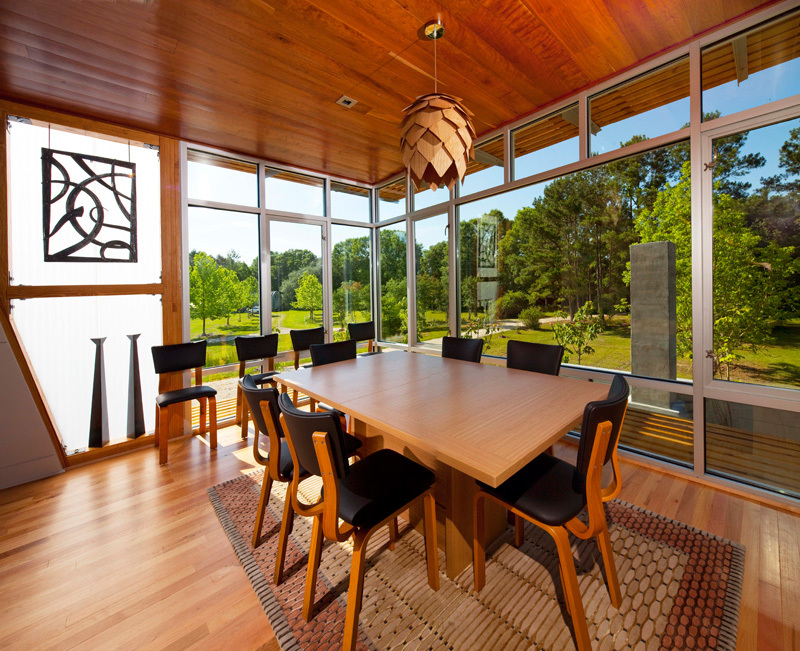 The Pond House at Ten Oaks Farm is a 1,250 square foot, net zero energy retreat located on a 15.5 acre site in Southeast Louisiana. 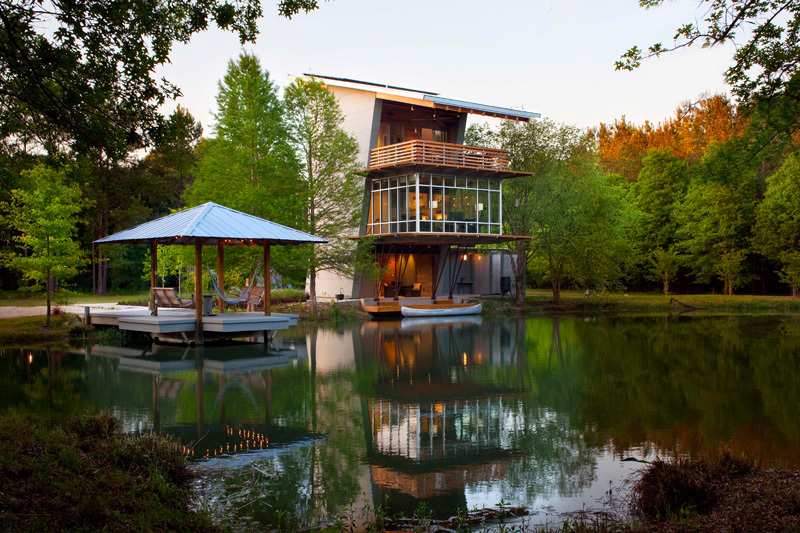 The three-story structure sits over the edge of a pond and overlooks a peninsula of ten oak trees that stretch out into the middle of the pond. 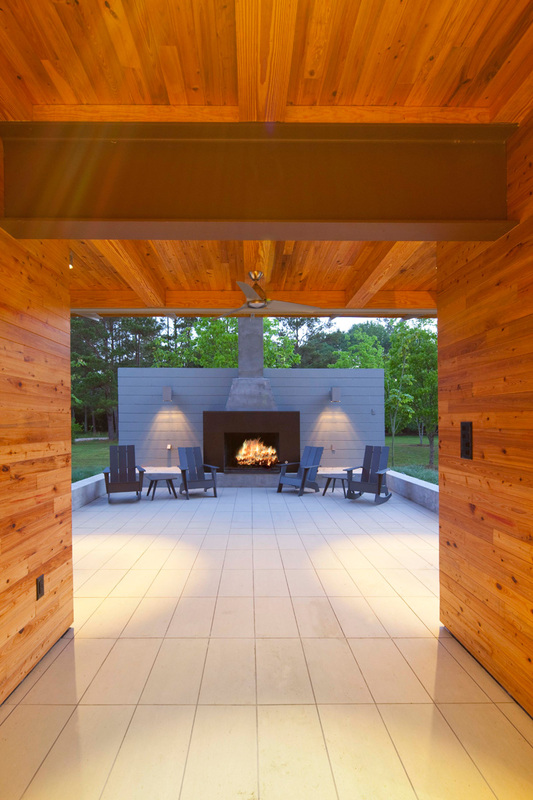 The Pond House features an outdoor area on the first floor including a fireplace and outdoor kitchen. 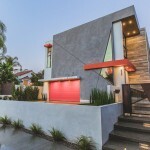 The second level houses a living room, kitchen, and dining room that are completely open with panoramic views to the surrounding landscape, and a master suite with an outdoor terrace on the third level overlooks the property. 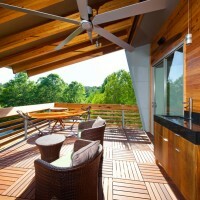 A single-sloping roof sheds rainwater into the pond while also allowing maximum sun exposure for solar panels. 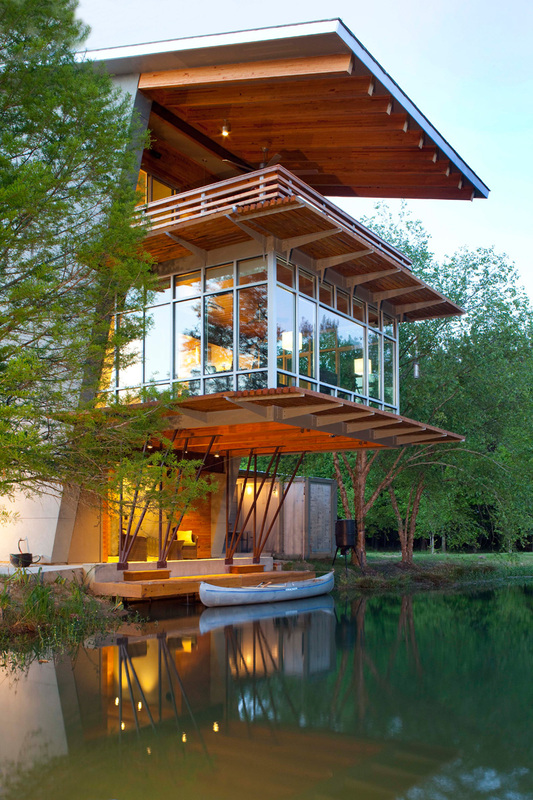 The form juts out at a 14 degree angle towards the water and the roof sits perpendicular to the structure. 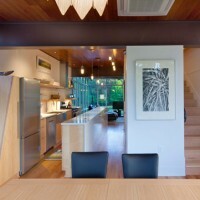 This angle is carried through the house to create a striking contrast between elements such as the kitchen millwork and floor to ceiling windows in the living and dining room. 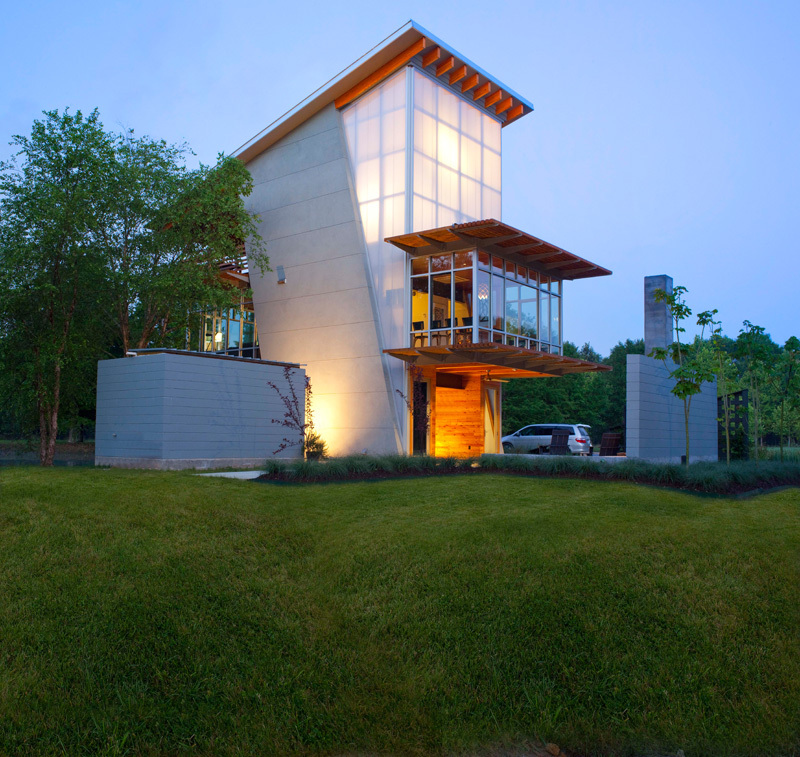 The facade consists of limestone textured stucco, opaque tongue and groove polycarbonate panels, and two transparent volumes that project out of the second floor blending the residence seamlessly into the landscape. 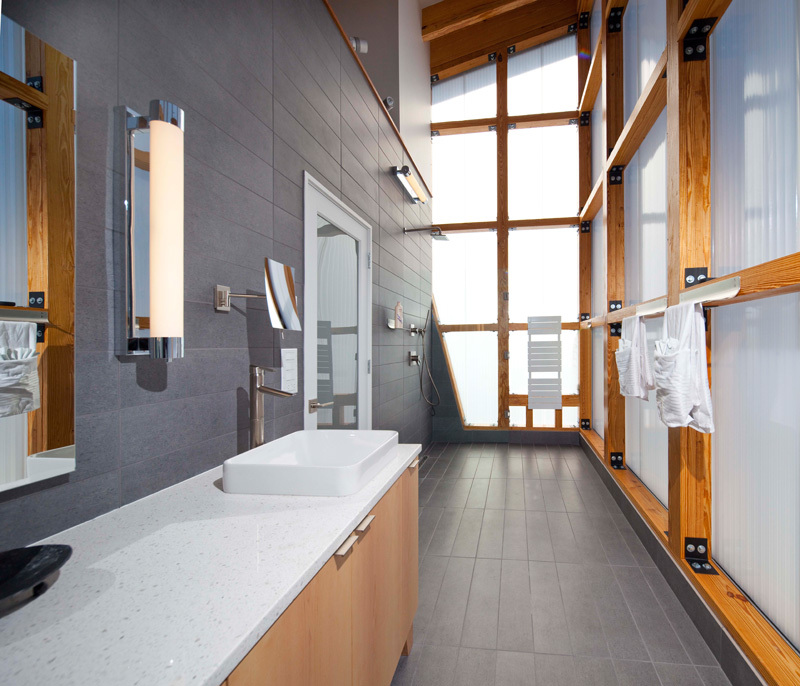 Transparent surfaces reveal a heavy timber frame and also allow the building to become an observation tower offering views to much of the site. 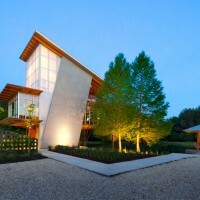 At night, the three-story volume comes alive as a glowing lantern emerging from the landscape magically illuminating the water. 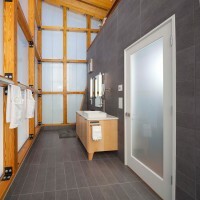 The Pond House achieves net zero energy capability through active systems employing a high efficiency heating and cooling system, solar energy, spray foam insulation for a tight building envelope, energy star equipment, and LED lighting throughout. 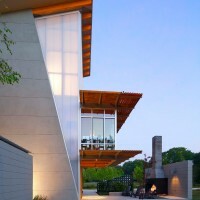 Along with utilizing active systems, the Pond House also features passive strategies to achieve a sustainable design through operable windows for cross ventilation, north-south building orientation, natural day lighting, shading strategies, reclaiming materials, landscaping designed for solar and wind changes through the seasons, and managing rainwater onsite. 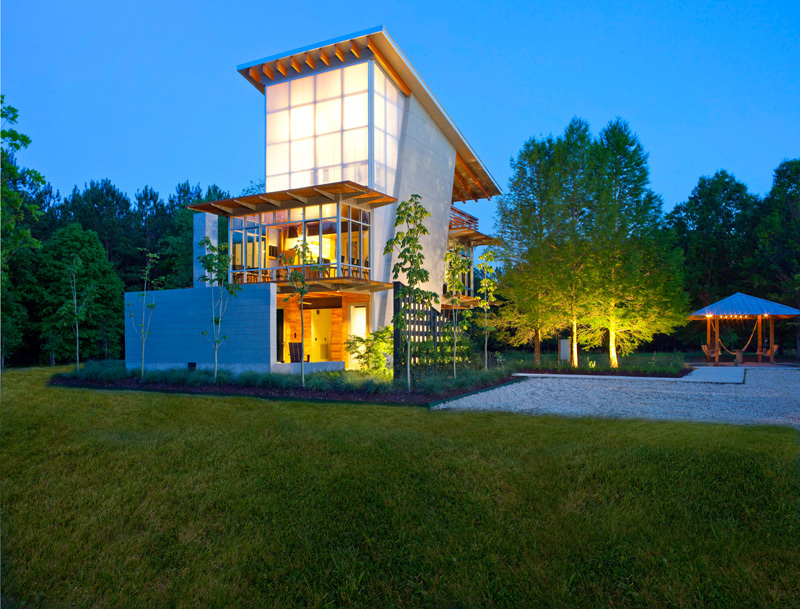 Since its completion, The Pond House has been generating instead of consuming energy. 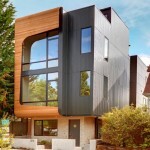 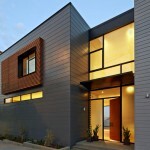 Within the mission of creating a sustainable design, this residence is an example that proves energy efficient houses can be comfortable, luxurious places to live. 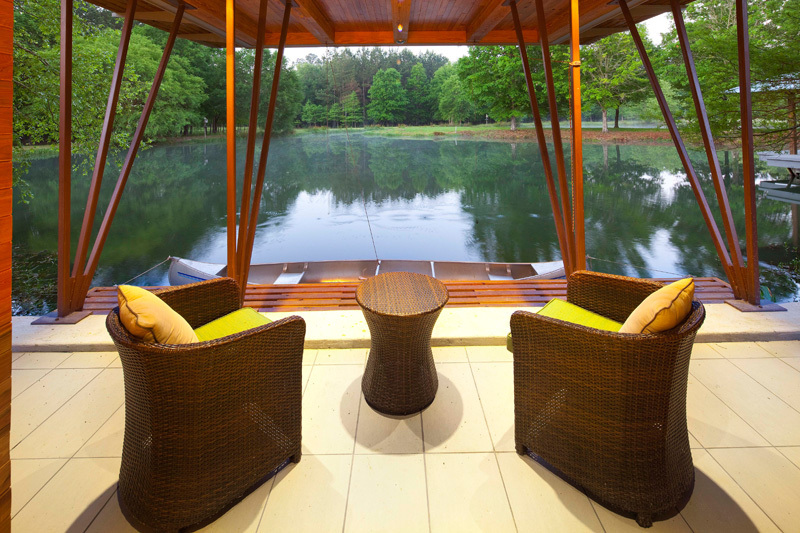 The Pond House is a place where family and friends can come together. 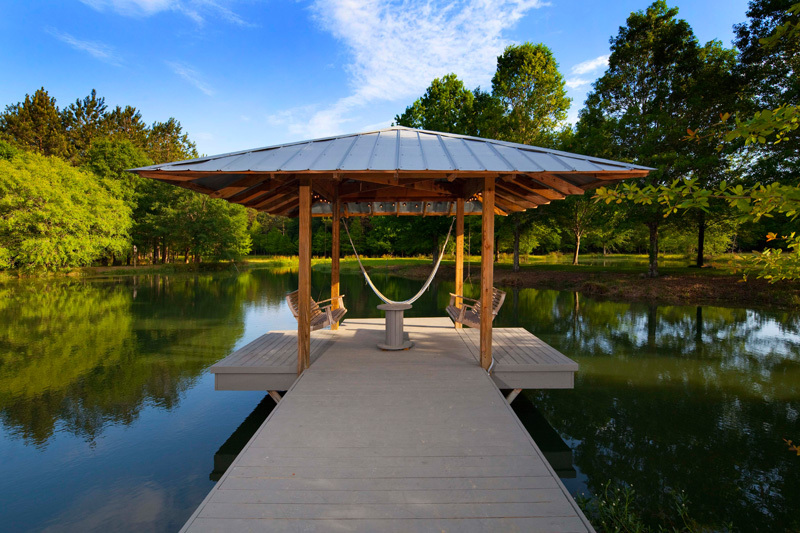 From swinging out by the lake, to hanging out on the terrace, or having an acoustic jam session by the fire, The Pond House offers many avenues of engaging in culture, adventure, relaxation, and observation inside and out.